The site on which to construct the Anzac Memorial attracted much public discussion in the decade that followed the Great War (1914-1918). 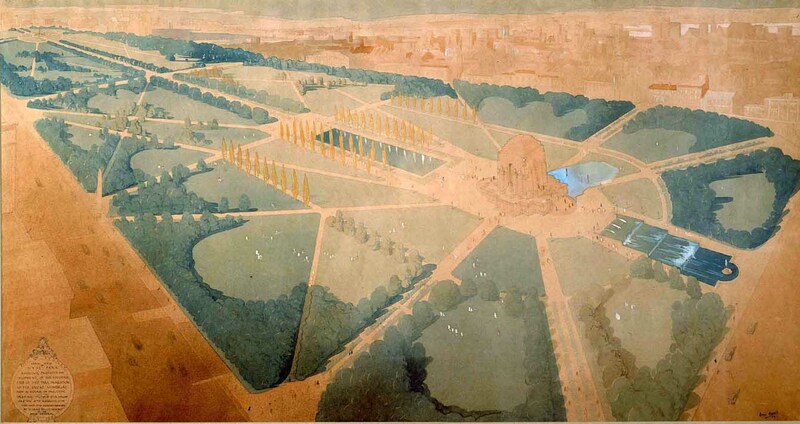 The proposal to build the Memorial in Hyde Park was strongly promoted by the former city surveyor Norman Weekes and was supported by the Institute of Architects. In March 1923, the Parliament of NSW passed an Act to appoint the Trustees of the Memorial and to give legal sanction to proceed with the erection of the Memorial in the park. Hyde Park was an ideal location for the creation of an Anzac Memorial precinct. Hyde Park is located at the southern end of a ridgeline that runs from the harbour, high ground that allowed the Anzac Memorial to be seen as a feature of the Sydney skyline. By the time of the construction of the Anzac Memorial Hyde Park was already home to several war memorials, including the Archibald Fountain, the memorial to the members of the Order of Odd Fellows who served in the AIF and the HMAS Sydney Memorial. The land now dedicated as Hyde Park has a history of use predating European occupation. Early written accounts by European settlers describe observing meetings of Aboriginal people on land now occupied by the park. These observations suggest that the park was the site of competition and apparently demonstrations of martial prowess by local Aboriginal communities. Colonists, particularly the British military garrison, frequently used the parkland for sporting competitions including cricket matches and horse races. By the late 19th century it was an established and frequented public park. In Hyde Park North statues were erected to Queen Victoria and her consort as well as William Bede Daly the colonial attorney general and acting premier who sent a contingent of New South Wales infantry, artillery and ambulance to the war in the Sudan in 1885. A smoothbore cannon on its iron garrison carriage stands a mute reminder of the Russian scare in the mid 1850s and the Archibald Fountain was built in 1932 as a tribute to the relationship between Australia and the French forged in the Great War. After the construction of the war memorials in the 1920s and 30s Hyde Park became a regular location for commemoration services. During the Second World War (1939-45) the unused railway tunnels north of the Pool of Reflection were converted into one of the largest public air raid shelters in Australia. A Second World War version of the Anzac Buffet, that had been a meeting place and recreation hut for servicemen and women in the Domain during the Great War, was constructed in Hyde Park. Since the great wars of the 20th century Hyde Park continues to be a place of recreation for people of Sydney and visitors and the Anzac Memorial a place of annual commemoration.